Palace President and CEO Alan Ostfield vividly recalls one incident that defines the past few months. It’s been three months since Ostfield was named president and chief executive officer at Palace Sports & Entertainment, which includes the Detroit Pistons, The Palace of Auburn Hills, DTE Energy Music Theatre and Meadow Brook Music Festival. Ostfield became CEO Feb. 17 after serving as chief operating officer for eight years. The word transition is used often as Ostfield speaks about changes that have occurred at the Palace. One major part of that change was the March 2009 death of Palace and Pistons owner Bill Davidson at age 86. “He was one of the most wonderful businessmen,” Ostfield said. Davidson was a billionaire who provided protection over the business, added Ostfield. “Now we are in the clear economic reality facing the same (economy) as other Michigan businesses,” he said. Davidson’s wife, Karen, has made headlines stating she wishes to sell the Pistons, DTE and the Palace. Ostfield took over when the Palace organization’s longtime CEO Tom Wilson resigned. Wilson, who was at the Palace for more than 30 years, now works as president and CEO of a yet-to-be-named sports and entertainment company within Ilitch Holdings Inc. in Detroit. The companies include Little Caesars, the Detroit Red Wings and Detroit Tigers. Several people who worked with Wilson have resigned from the Palace and are now with the Ilitch operations. But it’s talk of the Pistons sale that has had sports fans buzzing for months. Not only are the Pistons on the block, but the package would include The Palace and DTE Energy Music Theatre, said Ostfield. Meadow Brook is not owned by the Palace. Ostfield said he isn’t involved in sale discussions. “Ownership is handling that and leaving us to run the business,” he said. Ostfield believes a new owner would keep the team at the Palace. “One great quality of the Palace operations is the breadth of our business,” he said. He doesn’t believe the team will move. Selling the business might prove to be a challenge in this economy, but splitting up the properties doesn’t appear to be in the cards. One snag could be the intertwined bookings. “The same people who book the Palace book DTE and we have sponsorships that are together on both,” he said. With talk of a sale, outsiders might assume staff now hang in limbo, but Ostfield disagrees. “Ownership is saying, ‘Do what you think is best for the business.’ It’s natural to think we’d be in limbo but I don’t think that is well thought out,” he said. A Pittsburgh native, Ostfield’s one connection to show biz is through his mom. “My mother has directed musicals and plays in Pittsburgh for years and now has a company that uses theater to address social issues,” he said. As a boy he played a variety of sports — baseball, tennis, soccer and football — through his teenage years. “But I was nothing more than a good recreational athlete,” he said. Ostfield has a bachelor’s degree in economics from the University of Pennsylvania. He also has a law degree and MBA from Boston University. Ostfield began his sports career as an attorney with Wilmer, Cutler & Pickering in Washington, D.C., specializing in sports, corporate and bankruptcy law and worked with a client list that included the Dallas Cowboys. 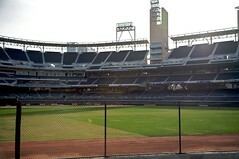 Ostfield then worked as senior vice president and general counsel with the San Diego Padres baseball club. He joined the Palace team in 2000 as senior vice president of business and legal affairs and assumed the position of chief operating officer. He also served as assistant general manager of the Pistons, managing the NBA team’s salary cap and participating in player negotiations and transactions. Ostfield also teaches. At the University of Michigan’s Sport Management Masters Program, he taught “Managing a Professional Sports Franchise” and he taught “Sports and the Law” at the University of San Diego School of Law. He’s been a featured speaker at various universities regarding the business and legal issues in professional sports. Since he took the top job, Ostfield has coped with “ups, downs, sleepless nights, all those things,” he said. Ostfield was recognized nationally in 2000, 2001 and 2002 when he was included in Street & Smith’s SportsBusiness Journal’s annual “Forty Under 40” list recognizing the 40 most influential sports executives under the age of 40. In 2002, Street & Smith inducted him into its “Forty Under 40” Hall of Fame. Ostfield and his wife, Jennifer, live in Beverly Hills with their children, Benjamin and Hannah. Dan Hauser, an executive vice president who has been with the Palace organization 32 years, said the changes taking place at the Palace are good. “Change can be refreshing, not always negative,” he said. “People are embracing the change. While we were sorry to see Mr. Davidson pass, it is part of life. Hauser has watched Ostfield manage. Dexter King, president and CEO of the Coppell, Tex.-based International Association of Assembly Managers, Inc., listed cities such as San Diego and Seattle where pro sports teams have been sold. “I’m sure there is always apprehension that affects the morale of employees (during talk of a possible sale),” King said. But he didn’t see the loss of a longtime CEO at the Palace as a negative. “Sometimes fresh blood is good and I would advise it from period to period, depending on goals,” he said. Recently a Russian businessman purchased the New Jersey Nets. King speculated on other sales. Ostfield said he and staff are not thinking about a pending sale, but instead are focusing on the summer concerts which feature stars such as Justin Bieber, Roger Daltrey, Eric Clapton, Green Day and Train. “We’re offering incredibly diverse concerts, something for everyone,” he said. He noted last summer was down due to the sluggish economy. “This year 75 percent of the DTE shows will be between and tickets,” he said. At DTE this summer, fans can take part in special promotions. This May, people could enter a contest to win ,000. Over the first quarter, the Palace was ranked as the second busiest arena in the country and the fourth busiest in the world, Ostfield said. “We were still in the top third in NBA ticket sales even given the fact the team was underperforming,” he said. Hauser said all those employees who work in operations, tickets, security, marketing, sales, Pistons operations, accounting, restaurant, graphics and merchandise represent jobs in the area. “It’s a huge impact on the community when we are doing well,” said Hauser. Hauser sees the economy coming back. “We have great fans, a great concert market and excellent venues,” he said. This entry was posted on August 10, 2011 at 4:10 pm and is filed under San Diego Padres. You can follow any responses to this entry through the RSS 2.0 feed.